Spider-Man and Yuri Watanabe find themselves at odds in Turf Wars. Also, hell yeah, you bet I’m still rocking that Spider-UK suit. Spider-Man is more about just the spectacular webslinger, or even the man behind Spidey’s mask. The supporting cast that comes as part of the Spider-package—his allies, his friends, his family, his foes—is just as vital. But as much as Spider-Man’s DLC content wants to try, it’s coming up short on doing those supporting stars justice. Turf Wars, the second chapter in a series of new story missions for Marvel’s Spider-Man dubbed “The City That Never Sleeps,” came out this week, and in many regards it’s very similar to the first slice of DLC released last month, The Heist. It adds a few new chapters to the game, more twists on familiar activities present in the base game to do, and some snazzy new suits for Peter to slip into. It also puts its focus on another important female figure in Peter’s life—except that this time, instead of it being the superthief Felicia Hardy, a.k.a. Black Cat, it’s Yuri Watanabe, Peter’s one-and-only friend in the NYPD. And it is also far too scant to expound on any of the intriguing ideas it sets up. After The Heist saw Maggia mobster Hammerhead re-ignite an inter-family crime war, Turf Wars spends most of its couple-hour runtime showing how Yuri and the police—with a little help from their friendly neighborhood Spider-Man—are trying, and failing, to cope with the rise in crime. 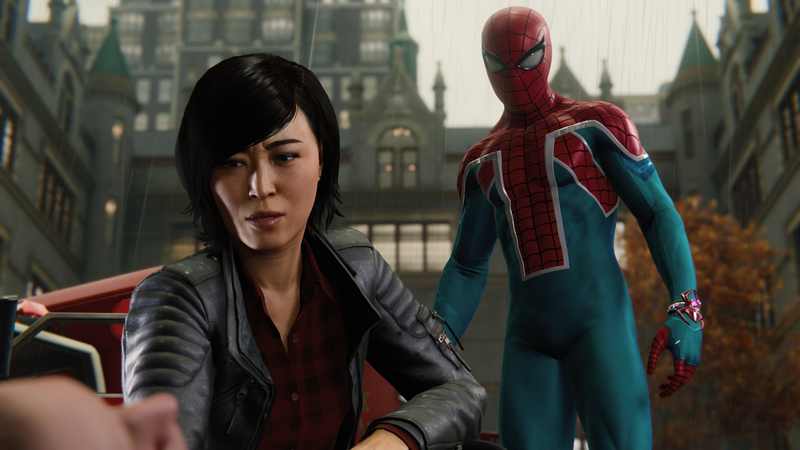 Which is saying something, considering that the game’s version of New York is barely months removed from having been put into lockdown thanks to the triple-threat of a deadly viral outbreak, a prison riot, and the Sinister Six themselves taking over Manhattan. All that was fine, but the Maggia? The NYPD is up against the wall! Hammerhead really shows up in Turf Wars, but it’s hard to care. This hits Yuri, who prides herself as a good cop, the hardest—and Turf Wars just keeps kicking her while she’s down. It starts miserably for her, as an attempt to bring Hammerhead in after he sets himself up in Harlem quickly becomes a disaster that gets an entire squad of men under her command killed. As Hammerhead’s grip on the city becomes stronger and stronger and more cops get caught in the crossfire, Yuri finds herself pushed to a breaking point that eventually sees her snap—abandoning Spider-Man and her ideals to go on a personal quest for vengeance against Hammerhead, with the hopes of taking as many Maggia as she can with her. As Peter finds himself in a race against time to stop both Hammerhead and Yuri, it all culminates in a scrap that sees Yuri seemingly execute the mobster in front of Peter and a squad of cops (spoilers: he somehow survives, thanks to a) the fact this is a comic book video game; and b) he’s got an awfully thick head). All of this is fascinating, but Turf Wars is way too short and way too slight to give any of its complex ideas narrative weight. Hammerhead, now the villain of two pieces of DLC (even if in The Heist he admittedly mostly goes unseen) and presumably the third, has been barely fleshed out. His sudden arrival on the scene as a threat so seemingly unstoppable that he can cheat death feels wildly unconvincing outside of the fact that “The City That Never Sleeps” needs its own Doc Ock, but he’s so threadbare as a character that it’s hard to care. Yuri’s downward spiral feels like it flies by so fast that it doesn’t feel earned. She goes from feeling like she’s done something therapeutic in calling the families of the cops that died on her watch, to racing off and apparently shooting up an entire bar full of Maggia henchmen in a matter of a couple of story beats, and because you naturally spend time with Peter as your protagonist, you never really get to see what Yuri’s going through despite the fact her story is what drives so much of Turf Wars. Yuri and Peter’s mission to stop gang warfare breaking out ends very, very badly. It’s frustrating because there are some really easy ways that Yuri’s arc in Turf Wars could be handled so much better—because it’s right there in the comics she came from in the first place. Introduced in Amazing Spider-Man back in 2009, Yuri, like she is in the game, was a police captain. But she eventually becomes the vigilante Wraith, operating outside of police jurisdiction to strike fear into the hearts of New York’s criminal underbelly. She worked with Spider-Man multiple times until a storyline called “Spiral” a few years ago, where her faith in the justice system was rocked by a corruption scandal that gets Tombstone out of jail. The event sparked a new crime war which eventually saw Yuri clash with Spider-Man over where the line is drawn on vigilante violence—after, interestingly, she’s manipulated by another Marvel’s Spider-Man figure, Mister Negative. There are clear parallels to what Marvel’s Spider-Man tries to do with Yuri’s arc to her progression in the comics. Had Turf Wars actually spent the time to build it up gracefully, there would’ve been some fascinating symmetry with the main game’s portrayal of Otto Octavius—and the way vengeance can consume the people nearest and dearest to Peter, in a way he never let it consume him when he first became Spider-Man. But Turf Wars is too short, too fleeting, and too concerned with Peter as its lens to the story to give Yuri the time she needs to sell her own arc. Yuri seals her fate with a killing blow to Hammerhead—or, so she thinks. It makes her fall from grace as the only cop willing to work with Spider-Man to a vengeful killer feel like tonal whiplash—and above all, it makes it hard to care, especially if the third and final chapter of “The City That Never Sleeps” ends up not picking up the threads of Yuri’s story, just as Turf Wars didn’t pick up anything left of Felicia’s arc from The Heist. As much of Marvel’s Spider-Man takes great joy in twisting what we know from decades of comics to make the familiar feel fresh, it seems like Turf Wars could’ve been much more satisfying than it is by spending the time to take a page out of those books.